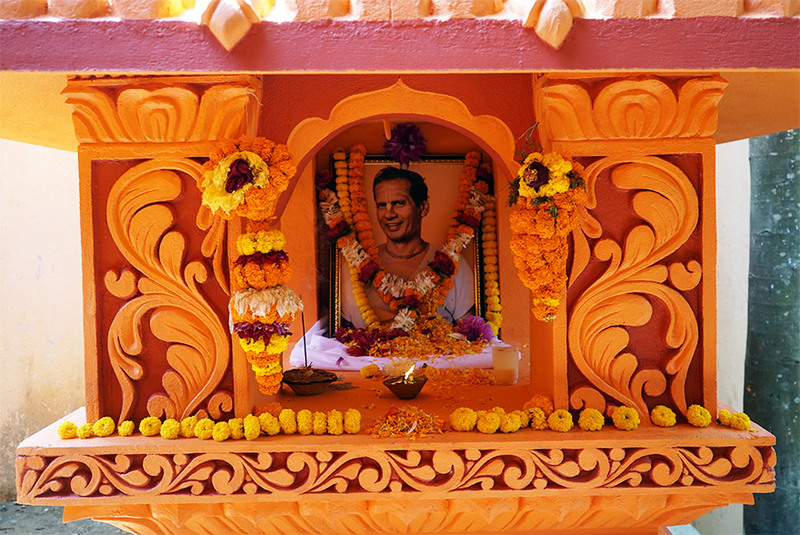 Yesterday was the one year anniversary of the departure of one of our devotees, Radhakanta Das. 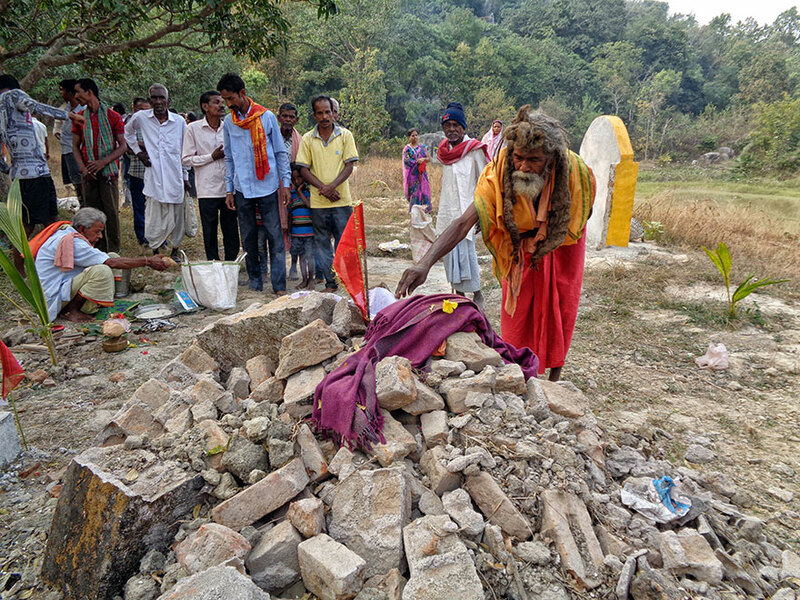 He was a very hard worker for the ashram, and helped watch over most of the project work for the last 15 years. He would sit with the construction workers for hours each day in the hot sun and oversee every minor aspect of the work to make sure every thing was done properly with no waste. Some of the ashram projects he over saw were the construction of the Jagannatha temple at Bhadrak, Odisha, construction of the Panchamukha Hanuman temple in Chennai, building rooms for sadhus in forests of Odisha, renovation of the ancient tirtha at Chakra Tirtha, construction of our goshala at Bhadrak, etc. Despite being nearly 70 years old, I would see him riding his bicycle every day in the hot sun to the shops to bring materials for the work. I would ask him to take an auto, but he didn’t want to waste Lord Krishna’s money. He would go by bicycle despite pain from the effects of a broken hip he suffered 10 years before that left him with a limp the rest of his life. In all the 15 years he watched over the ashram’s projects he never took even one rupee as salary or payment. He only wanted to spend his life doing service for Lord Krishna. In ISKCON he was the first disciple initiated by Jayapataka Swami in 1978. He spent 25 years helping to spread the ISKCON movement in Bhadrak, preaching the message of Bhagavad Gita in the nearby districts and making many devotees. His departure last year was quite sudden and glorious. Every day he would wake up at 3 am, take bath and then go to the temple for mangala arati. On the day that he departed, he got up as usual at 3 am, took his bath, went to the temple and did the puja for awakening the deities and opening the temple. Then he did parikrama of the temple and took charanamrita (the water used to bathe the shalagrama in the temple). After this he began leading the morning kirtan, singing the guruvashtaka prayers that are sung daily during the mangala arati. 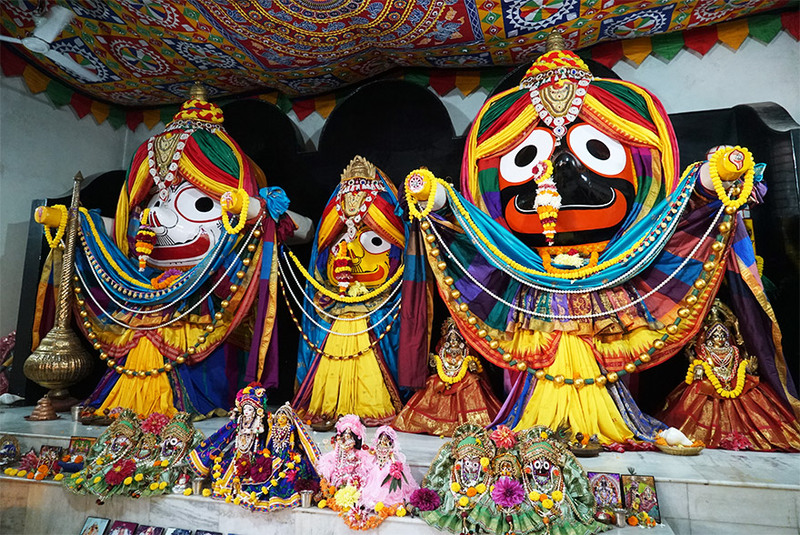 …while staring at the deities of Lord Jagannatha his soul left his body and the brass gong fell from his hands to the floor along with his body. 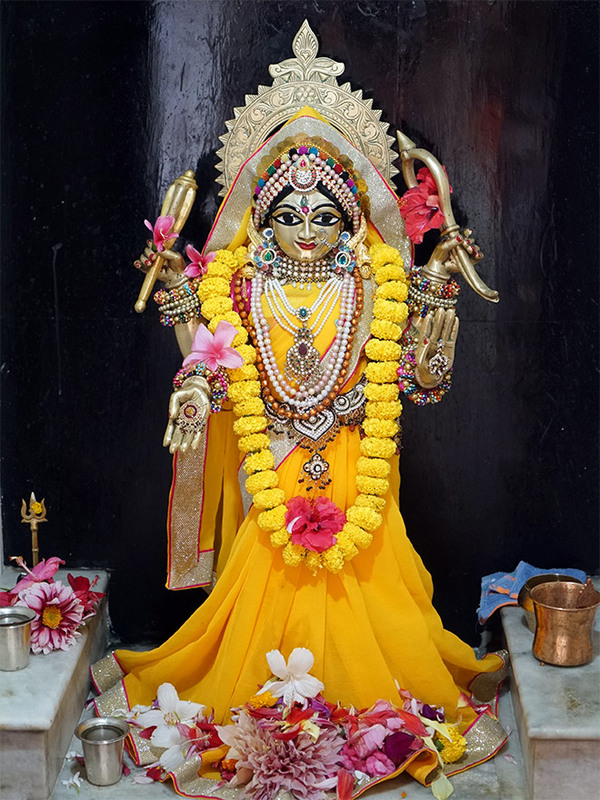 He was surrounded by 10 other devotees, one of whom caught him as he fell, but his soul had left instantly while staring at Lord Jagannatha and singing kirtan to Him during the mangala arati. Only a very special soul can have such a wonderful departure, surrounded by devotees, in the temple singing kirtan for the Lord. 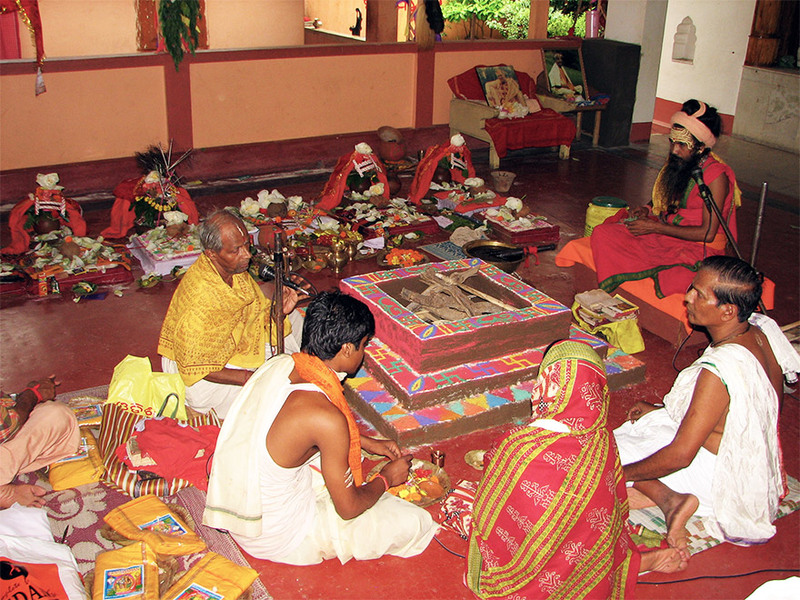 During the installation of the Jagannatha temple at Bhadrak, the purohits asked me to sit in the yagya as yajamana. I called to Radhakanta Das and asked him to be the yajamana, as he did most of the hard work for building the temple. Radhakanta Das sitting as yajamana with Swami Bhairavananda performing temple pratishtha. 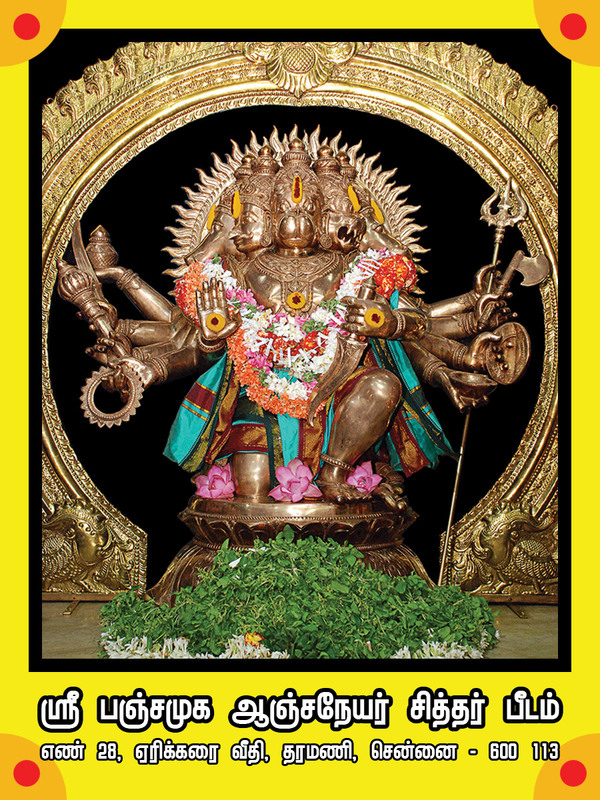 Once during the construction of the Panchamukha Hanuman temple in Chennai Lord Krishna saved him from death so that he could finish the temple work. He had traveled from Odisha to Chennai alone in a sleeper class train, which is around 24 hours journey. At the Chennai central station a devotee picked him up in the evening, and he rode on the back of the motorcycle along the Mount road to come to Velachery. Those who are familiar with Mount Road know how terrible and fast the traffic is on that road in the evening. If anyone were to fall off the motorcycle while going on that road they would surely be crushed under the speeding cars and buses behind them. 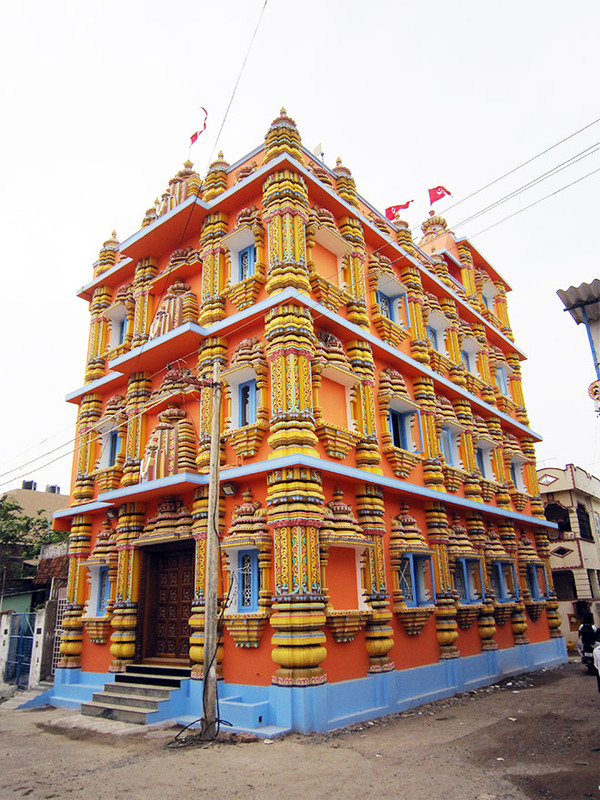 Panchamukha Hanuman temple at Taramani, Chennai. By Lord Krishna’s grace, the motorcycle came to a stop at a traffic signal on Mount Road, and just as it stopped he suffered a brain stroke and fell unconscious in the middle of the road at the traffic signal. Imagine if he had suffered the stroke 1 minute earlier or 1 minute later while driving on the Mount Road in rush hour traffic. He would have died instantly. Even if he had suffered it in the train, he would have died without receiving immediate treatment on the 24 hour train ride. The only place where he could experience it safely was at that traffic signal when all the vehicles had stopped. He was quickly put into an auto rickshaw and taken for emergency treatment where within a few days he had recovered and suffered no ill effects. In a short time he was back to overseeing the temple construction for Lord Hanuman in Chennai. 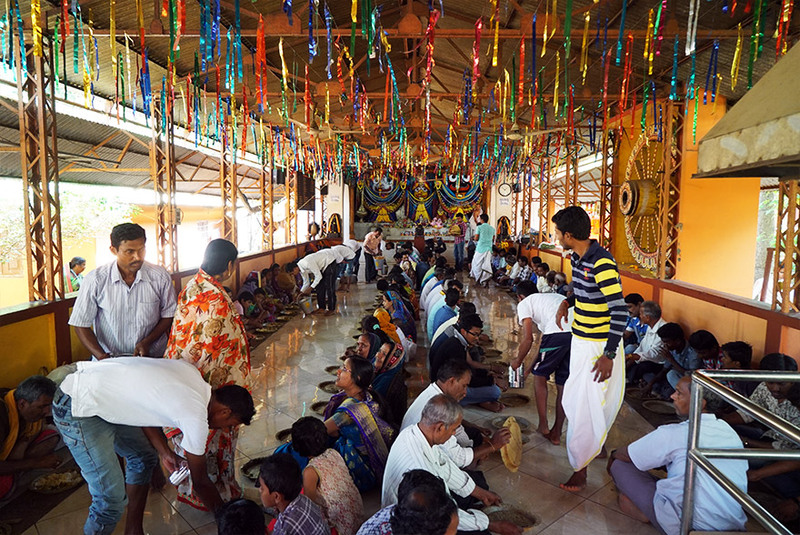 Devotees attending the 1 year departure anniversary of Radhakanta Das. 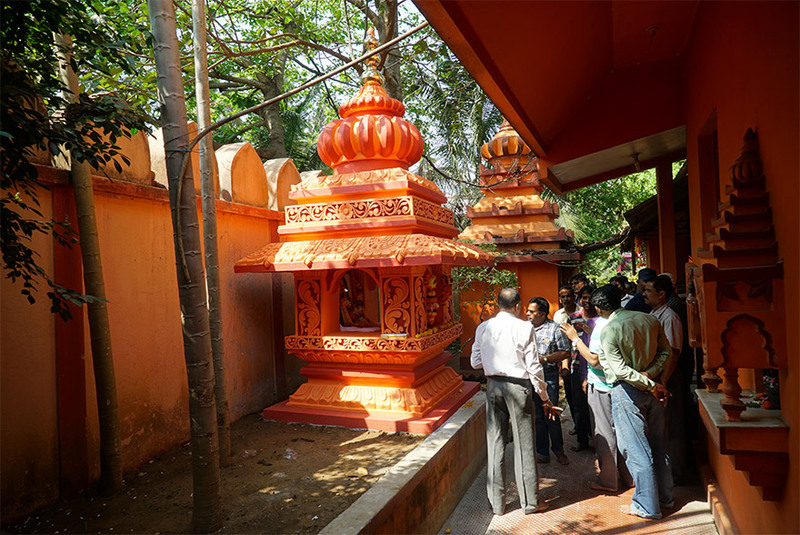 Since he played such a large role in building the Jagannatha temple in Bhadrak, we wanted to make a small samadhi memorial next to the temple so this history could be preserved. For the last 3 months we have been working to complete the samadhi in time for the one year anniversary of his departure. Somehow the samadhi was completed and painted just the day before the 1 year anniversary. Many devotees attended, and hari-nama sankirtana was held from morning till noon. 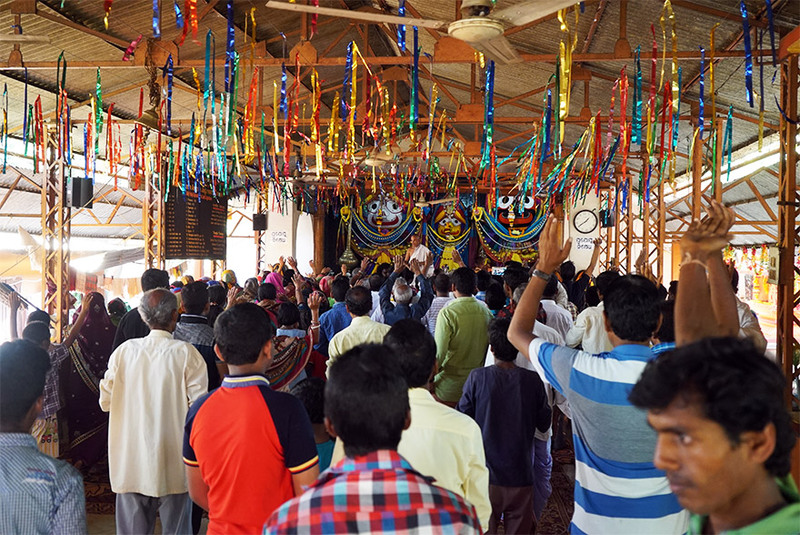 Around 500 devotees attended and annadanam was distributed to everyone in his memory. Distribution of annadana, during departure anniversary. I had one interesting experience on that day which to me was a sign from Bhagavan. Due to a lot of work in preparation I had not slept from the previous day. Even though I did not sleep, I felt I should not go to the samadhi till I could take a proper bath and put on fresh clothes. So somehow the entire morning went by with me doing some work or another, and I had not gone to the samadhi yet. By 11 am, I went and took a bath, put on a dhoti, applied tilak (namam), and then planned to go to the samadhi for offering flowers. By this time the hari-nama sankirtana had been going on for several hours from the early morning. 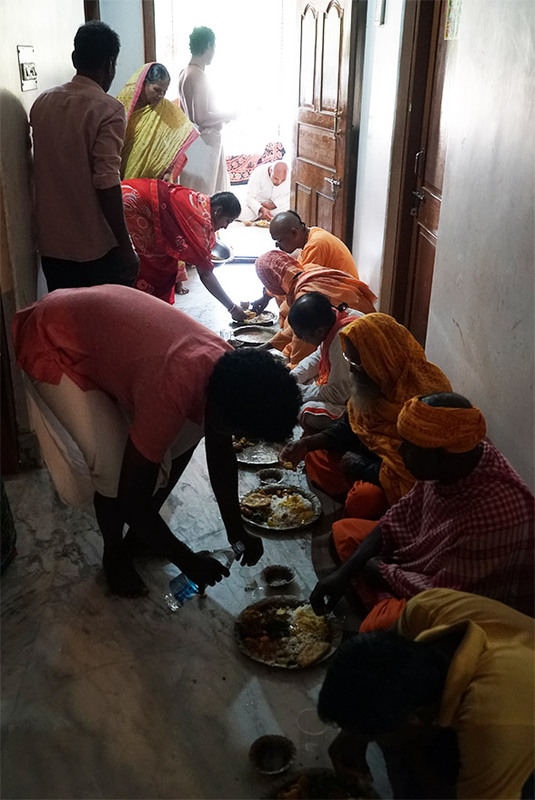 Feeding sadhus from ISKCON and Dayalu Baba ashram. I was not paying much attention as I walked by the temple, but I saw the kirtan had stopped a couple minutes before and Purnachandra Prabhu, a sadhu from ISKCON, had begun to speak on Bhagavad Gita. As is the Gaudiya custom, he first began by reciting mangalacharana, the auspicious invocation verses chanted before speaking on the Gita. I wasn’t paying much attention at this point, but could hear him as he recited the shlokas in the microphone. 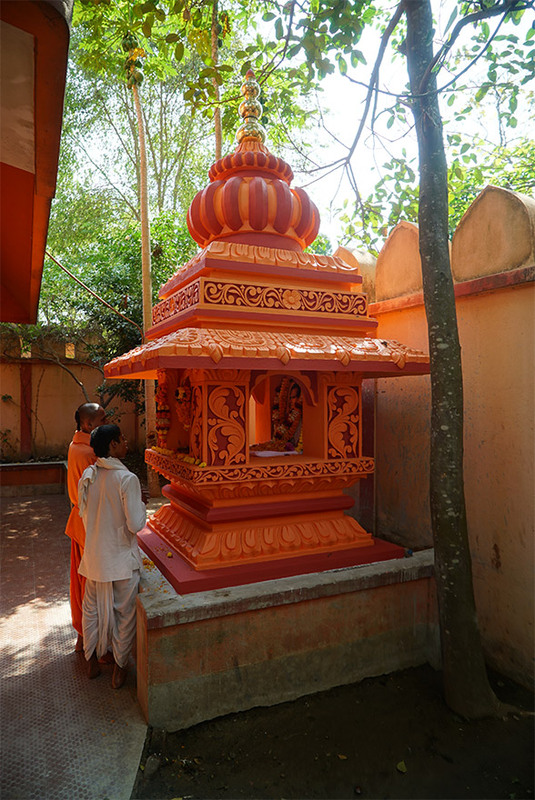 The samadhi memorial of Radhakanta Das. What are the odds that at the exact moment I come to the samadhi and pick up flowers to offer to Radhakanta Das I hear these words in the microphone, “…radhakanta namo ‘stu te – Radhakanta, I offer my obeisances to you.” The exact second as I am releasing the flowers, these words echo out in the microphone. I had not been paying attention to what was being spoken, but as I heard those words it was like a shock. Bhagavan was giving me a sign that he was pleased with the arrangements to glorify his devotee, Radhakanta Das. GOD is great. The SUPER-GUIDE. We should be fortunate to think of HIM. Radhakanta Das is a great example. We need not even think of what we need. GOD knows all. We are always in the best of situations, best places and in best company. This can happen with our devotion to God Service to society is one of the best devotion to God. A great soul among us, who practiced values, not just preaching. It is great experience reading article. It is rarest of occasions, where reciting namakirtana and looking at the devine murthy, Ramakanthaji departed for His abode. Gita ensures Lord,s abode for such souls. An exemplary personality for any one to emulate. Lord’s abode is the only destiny of such great devotees! Hare Krishna! I am both humbled and heartbreaking sad for this mahatma of souls.such devotional servitude is unbelievable in this modern materialistic times. We pray thanks to our Lord for sending such a being amongst us. Jane wale ki Yaad ati hai. Rest in peace… HE calls all those he loves. A sacred soul only will have such gift. our eyes could not control the water flowing while reading this article. we are from mumbai and used to go to chennai . we could not have time to see the panchamuka hanuman temple at taramani. we will do it next time we visit chennai. Thanks for writing about a great Devotee of Lord Krishna! What a wonderful article about such a great soul! It’s real life stories like this that inspires us to be and do better in this life. We have much to give to humanity and this world and God will always guide us when our devotion comes from the heart and soul. Radhe Radhe! Thanks for glorifying Radhakant Prabhu and I offer my danvat pranama at his lotus feet on this glorious day. It was really touching and such great souls are there in our land. We should learn a lot from those souls and will be happy if such incidents of great souls are written so that we all will come to know. While reading about great souls, we get cleansed, purified and feeling that they are guiding us and taking us on the right path. jai krishna and glory to the creator! Radhakant Prabhu was a great person and I salute him. Such a devoted person I cant imagine. He was a hardworking Human being and very religious devoted and selfless person. Very Inspiring for true devotees and those who are on the fringe of entering the service to the Lord. Sir, thank you so much for relating this wonderful and true story to us. This devotee was truly a great soul to have been praying till the very end of his journey; he’s surely with the Lord!